No they're not redheads. But otherwise they could pass for smaller, fuzzier versions of the Weasley twins. They look so cute and harmless in this photo. 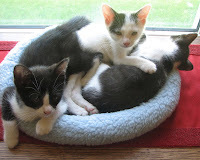 But when you get this many littermates together -- and they feel comfortable and safe -- they become quite the home terrorists. The kittens been with us for exactly two weeks today. When I found out that my friend Kate had two male kittens available for adoption, we put them on order and waited until they were old enough to leave mama safely. I'd been wanting a little boy kitten to keep Henry company ever since his brother Alex died from FIP earlier this year. He's been so lonely ever since -- wanting a playmate. None of the other cats will play with him. And, of course, when you get one kitten I believe you should always get two. Thus Fred (far right) and George (far left). You noticed that there's three? Yep. Tommy claimed the third from Kate. He and Cortney are taking him with them when they move to their apartment (near school and work) in a few weeks. Tucker. He's the lightest one... in the middle. So, back to Fred and George (and Tucker, currently on loan). They attack my dinner, constantly sit on the power button of my laptop and turn it off, climb my bare legs to get into my lap, and are amazing little purring balls of fluff. Tiny fluffy balls of joy.... with sharp edges.